The Basilica di San Lorenzo (Basilica of St Lawrence) is one of the largest churches of Florence, Italy, situated at the centre of the city’s main market district, and the burial place of all the principal members of the Medici family from Cosimo il Vecchio to Cosimo III. It is one of several churches that claim to be the oldest in Florence; when it was consecrated in 393 it stood outside the city walls. For three hundred years it was the city’s cathedral before the official seat of the bishop was transferred to Santa Reparata. San Lorenzo was also the parish church of the Medici family. In 1419, Giovanni di Bicci de’ Medici offered to finance a new church to replace the eleventh-century Romanesque rebuilding. Filippo Brunelleschi, the leading Renaissance architect of the first half of the fifteenth century, was commissioned to design it, but the building, with alterations, was not completed until after his death. The church is part of a larger monastic complex that contains other important architectural works: the Old Sacristy by Brunelleschi; the Laurentian Library by Michelangelo; the New Sacristy based on Michelangelo’s designs; and the Medici Chapels by Matteo Nigetti. Though considered a milestone in the development of Renaissance architecture, S. Lorenzo has a complicated building history. Even though it was built – at least partially – under the direction of Filippo Brunelleschi, it is not purely of his design. The project was begun around 1419, but lack of funding slowed down the construction and forced changes to the original design. By the early 1440s, only the sacristy (now called The Old Sacristy) had been worked on as that and not the church was being paid for by the Medici. In 1442, the Medici stepped in to take over financial responsibility of the church as well. Brunelleschi died, however, in 1446 and the job was handed over either to Antonio Manetti or to Michelozzo, scholars are not certain. Though the building was “completed” in 1459 in time for a visit to Florence by Pius II, the chapels along the right-hand aisles were still being built in the 1470s and 80s. The church dates to at least 1116, and presents a Romanesque façade whose lower half is older, with simple doors bordered by architraves, and arches. The main entrance, which has a two-coloured stone moulding, is late 13th century. The church was badly damaged during the Second World War, and again by the 1966 flood. The interior is rectangular, and originally had three aisles, which were merged into a single nave by F. Tacca between 1649 and 1655. The roof has exposed trellis-beams that are at two different elevations. The church has now been deconsecrated, and hosts the Orchestra Regionale Toscana. The front half of the church has altars from the 1500s, while the back half is architecturally subdivided into two orders that open towards the presbytery, which is proceeded by an interesting marble staircase with balustrades of a kind Bernardo Buontalenti had already placed in the Santa Trinita. 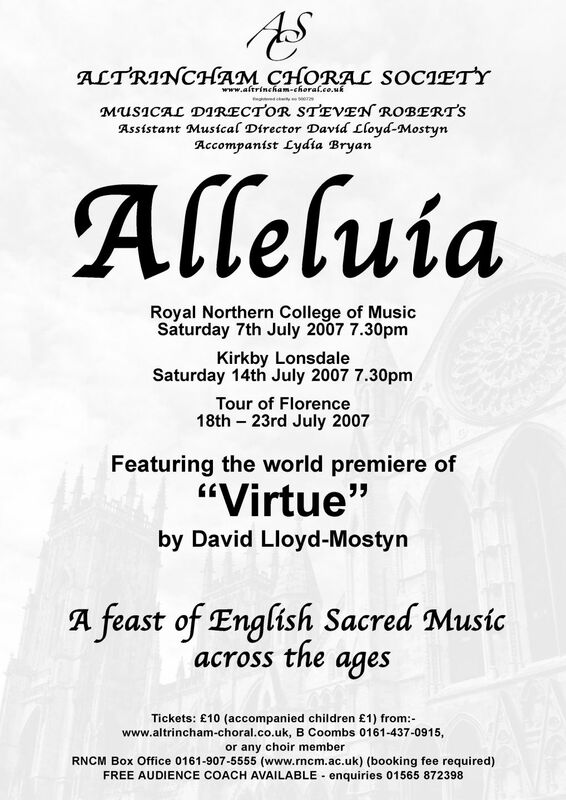 In a celebration of English Sacred Music, the difficulty is not what to include, but what to leave out. There are of course some greats who have to be included – Rubbra, Tallis, Blow, Vaughan Williams, Purcell, and Byrd for example. But, what of those composers who have less prominence but have equal right to be included – Alcock, Lloyd, Chambers and Wood. Finally, do they all have to have lived a century or so ago? Well, the answer is no! Three of our composers are very much alive –Lloyd, Lole, and of course Lloyd-Mostyn. Performing a work for the first time brings with it many challenges which first performers throughout the age have had to deal with – is it going to be hard or easy? Will the audience like it or not? These are just two of the questions we ask ourselves, but neither actually matter – the excitement of performing a work for the first time is something that not many singers get the chance to do and for ACS it is an honour to have the opportunity to experience this and to be conducted by the composer. But, what about those piano pieces by Liszt and Debussy? Well, they are not English composers, but the works’ subject matter is highly sacred which is why this music complements the setting of the sacred texts from the choir. There will be something for everyone in this concert – there are no cymbals and loud crashes, but there is the opportunity to reflect and to listen to quality English music sung well. It is obviously quite impossible to be an objective music critic when one is a participant in a performance. However, the praise heaped upon us by complete strangers from Arizona as we left the church on the conclusion of the Saturday evening concert at San Stefano, was astounding. They couldn’t find words sufficiently superlative to praise the performance. They politely asked permission to send us by email the photographs they had taken as a memento of a most wonderful evening. From our point of view, the experience of singing in beautiful surroundings such as San Lorenzo (in particular) was a privilege, very emotional and moving. The Basilica of San Lorenzo leant itself perfectly to a capellasinging as it has a very long reverberation time and clear dynamics, due to the rectangular plan and the lack of a transept – which tended to muffle sound in later church design. Both performances must have been exemplary because the audience responded magnificently each time, with applause of real fervour, perhaps due to the Italian blood and the local red wine! Lydia’s performances on both occasions were as we have come to expect, full of feeling and verve. Steven conducted in an assured and energetic style and was pushing us nearer to his concept of perfection with each extra rehearsal and performance. He really was a Maestro, in control of the whole situation. Particularly impressive was the (apparently) immaculate Italian with which he introduced the items to the audience, while we ourselves were attempting to sing in our very best English and Latin. Despite leaving home without one, I managed to find the obligatory black shirt. A Policewoman who threatened to arrest me was pacified when I explained I was a Grandfather and not a Godfather. The first of the choir’s concerts in Florence took place in the splendid and atmospheric Basilica di San Lorenzo. From 8-30 p.m. a crowd was gathering on the steps in the still hot Florentine evening and by 9 p.m., when the concert began, the church was virtually full. Despite the fears of Musical Director Steven and of some of the choir, the acoustics of the church proved to be excellent. Steven and Accompanist Lydia entered to general applause and Steven delivered fluently and graciously the Italian introduction prepared for him by Helen McBride. The choir then began with two short pieces – the Alcock Sanctus and the Charles Wood Oculi Omnium, which were listened to with rapt attention by the audience. One is tempted to write ‘the congregation’ since the atmosphere was so reverent and the setting so appropriate that the audience sat respectfully, without applauding, as the choir continued with Charles Wood’s O Most Merciful, Edmund Rubbra’s The Virgin’s Cradle and John Wood’s Lord Be Thy Word My Rule. Lydia’s piano solo, the Debussy La Cathedrale Engloutie was greeted with enthusiastic and prolonged applause, and when the choir resumed, the audience, no longer inhibited, applauded each further offering in appreciation of the different styles and genres of sacred music, from the profound majesty of Purcell’s Hear my Prayer O Lord and Byrd’s Ave Verum Corpus to the wholehearted 19th century hymn of Sebastian Wesley Thou Wilt Keep him in Perfect Peace and the pieces by Lole and Chambers. The applause at the ‘end’ of the concert was sustained and fervent and it was therefore much appreciated when Steven introduced the (carefully prepared) surprise encores. The choir then concluded the evening with Stainer’s God so Loved the World and John Rutter’s The Lord is my Shepherd, respectively excellent examples of 19th and 20th century English sacred writing. Both were rightly received with prolonged applause and afterwards compliments and congratulations on the performance, in the accents of several different nationalities, were paid by members of the enthusiastic audience. So a very successful evening for the choir and its faithful band of ‘groupies’ – the spouses, parents and friends of choir members. From a personal viewpoint, though the concert was excellent overall, there were some special moments. It was particularly magical to hear the music of two of our greatest composers of the genre, Purcell and Byrd, floating up and outwards in this beautiful church. The choir provided its audience with a deeply felt and uplifting experience, responding sensitively to the nuances of Steven’s conducting. Lydia’s playing was splendid as ever. The final moments of the concert were for me particularly memorable; the choir’s performance and Steven’s conducting of God so Loved the World was superlative and provided, for this listener at least, a whole new perspective on this well known Victorian piece. The second concert was two days later, in the heart of the area round the Ponte Vecchio, at the Church of Santo Stefano, now changed from a church to a concert venue. The audience was, this time, somewhat smaller than that of the previous concert; supporters distributing flyers for the concert were met with many rebuffs from visitors in that popular tourist area. However, the audience was of a respectable size. At the beginning of the concert the choir made a splendid theatrical entrance from the crypt and took up its place on the raised and pillared altar space. The programme was almost the same as that of the previous concert and the choir again performed excellently. The acoustics showed to great advantage the beauty of some of the sublime short pieces, especially the polyphonic motets. One change in the programme was the replacement of the Purcell by O Nata Lux by Thomas Tallis – a welcome inclusion of our other great Tudor composer. The audience applauded every piece from the beginning, expressing particular enthusiasm for Lydia’s solo, and again for the two ‘encores’ by Stainer and Rutter, and expressing its delight and appreciation in its comments afterwards. So the Florence tour was an undoubted success. As one of the choir ‘groupies’ I offer my praise and appreciation to the choir (without whom there would be no tour), to Steven and Lydia for their professionalism and especially to Pam Moult for her splendid organisation of the whole tour – a Tour de Force indeed!